a kaleidoscope of colours, encased in glass. | owl's house london. a kaleidoscope of colours, encased in glass. Finnish glass, whether for everyday household use or artistic display, is amongst the most covetable and collectable in the world. 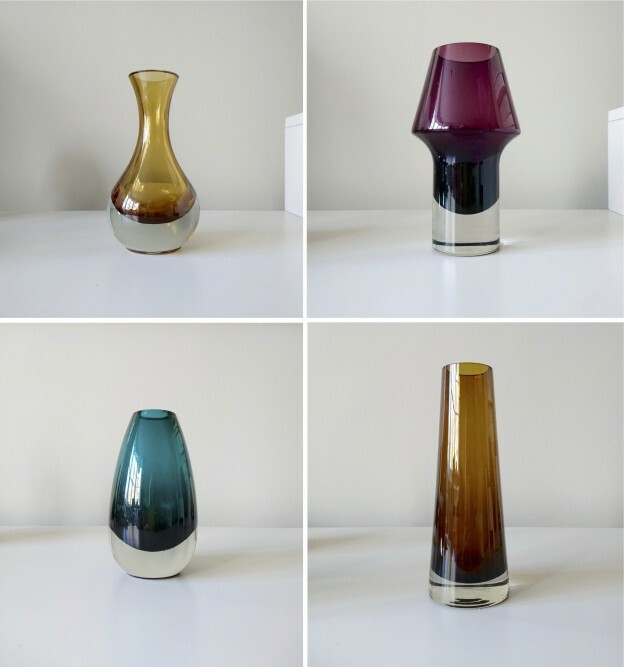 While there are few design-lovers today who are not familiar with Kaj Franck’s Kartio glass series for Iittala, pieces by Riihimäen Lasi — a glass factory that operated in Riihimäki, Finland, from 1910 to 1990 — are a little less well known. The factory started out as a producer for packing and window glass, but around 1937 moved into handblown design glass as well. The factory employed a range of designers who produced a large variety of shapes and design. 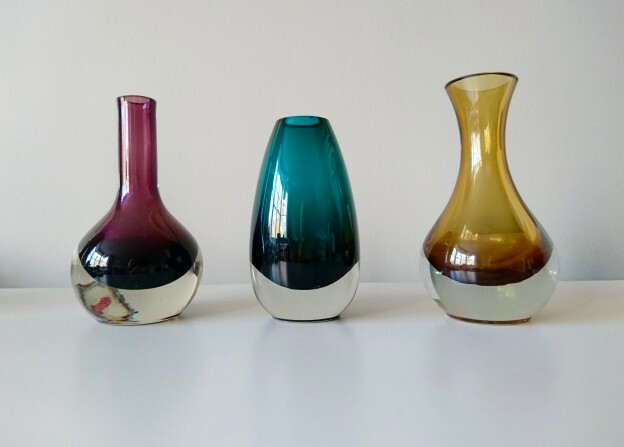 The works of three of them are shown here (from the author’s unassuming collection): Aimo Okkolin, who joined in 1937, Tamara Aladin, who was taken on board in 1959, after she presented her designs for a more lightweight, feminine drinks glass and Erkkitapio Siiroinen, who came to the factory in 1968. The depth of the colours and the clean lines of the vases satisfy the viewer over and over again, and the heaviness of the glass feels wonderful in the hand. The pieces are made by encasing one layer of coloured glass within the other. Sadly, the production of blown glass was not commercially viable for Riihimäen Lasi and was ceased in 1976. For the would-be collector, the simpler vases are not impossible to track down. A great number were ‘Made for Export’, mainly to Germany, and can now be found there (try ebay.de) as well as in the UK, with simple pieces starting at £30. 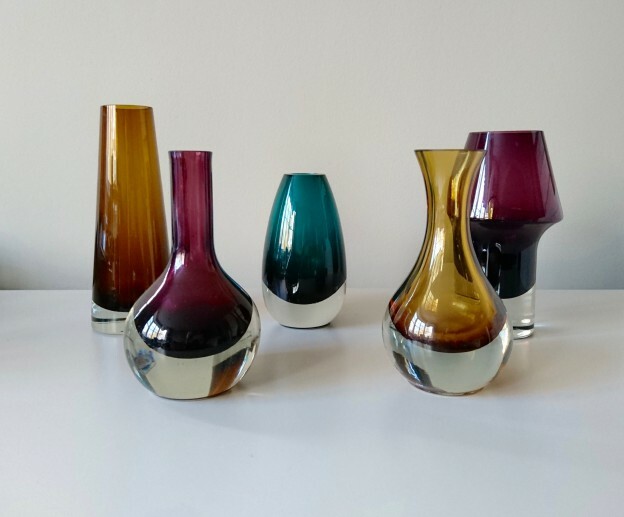 Although a lot of thought and skill went into the making of the vases, one of Riihimäki’s best known designers, Nanny Still, quipped that often the beautiful colours were haphazard, a mere mix of Finnish pragmatism and frugality: the designers used whatever was left over at the factory that day. If you are currently fretting over the exact shade of minimalist greige for your living room wall, take a breather. Guest post and photographs by Päivi Kotro-Brenner, a Finnish born copywriter and would-be artist living in London. Her living rooms walls are painted in Atkinson Grey by ECOS. This entry was posted in found objects. and tagged iittala, Kaj Franck, Riihimäen Lasi on November 22, 2015 by owls house london..